Each year, the United Soybean Board gathers and publishes information on commercially available industrial soy products and ingredients for businesses and consumers. The Soy Products Guide is for informational purposes and includes products that included soy in some form, regardless of whether soy is the primary ingredient. The products are organized into categories, from furniture and cleaning products to flooring, lubricants and foods. Manufacturer information is also included for individuals and companies looking to follow up on specific soy products. Want to learn more? 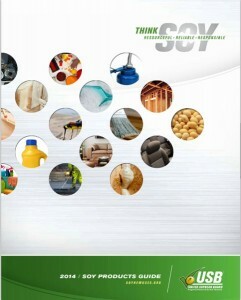 Check out the Soy Products Guide online.